No judgement of taste is innocent - we are all snobs. 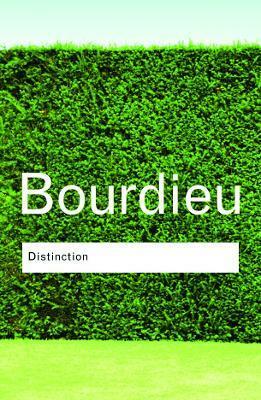 Pierre Bourdieu's Distinction brilliantly illuminates the social pretentions of the middle classes in the modern world, focusing on the tastes and preferences of the French bourgeoisie. First published in 1979, the book is at once a vast ethnography of contemporary France and a dissection of the bourgeois mind. In the course of everyday life we constantly choose between what we find aesthetically pleasing, and what we consider tacky, merely trendy, or ugly. Taste is not pure. Bourdieu demonstrates that our different aesthetic choices are all distinctions - that is, choices made in opposition to those made by other classes. This fascinating work argues that the social world functions simultaneously as a system of power relations and as a symbolic system in which minute distinctions of taste become the basis for social judgement. This is at once a vast ethnography of contemporary France and a dissection of the bourgeois mind. The subject is the study of culture, and the objective is most ambitious: to provide an answer to the problems raised by Kant's Critique Of Judgment by showing why no judgment of taste is innocent. Pierre Bourdieu (1930-2002) was one of France's leading sociologists. Champion of the anti-globalization movement, his work spanned a broad range of subjects, from ethnography to art, and education to television.